How to add background music to the page-flipping book? Generally for improving the look and feel of the whole page-flipping flash book, you need to add moving background music. It must be necessary if you plan to make it readable and attractive. You know, people would like to read with listening wonderful background music. FlipBook Creator for MAC supports audio background. You can create stunning flipping books on MAC with unforgettable music. Step1: Turn to the left settings area. Step2: Go ahead to the options "Tool Bar Settings --> Buttons Bar --> Sound". 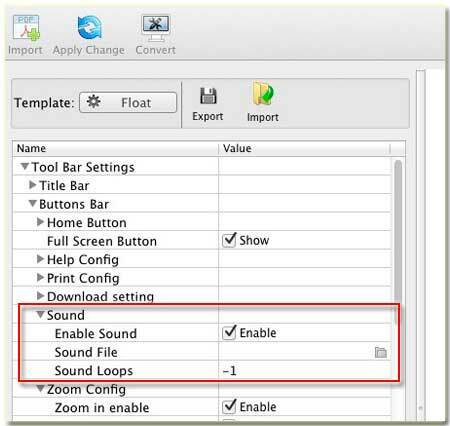 Step3: check the option "Enable Sound". Step4: select a suitable audio file from local disk. Step5: setup the loops, -1 stand for the unlimited loop, number which bigger than 0 stands for the relevant count. After the basic settings completed, you should click the top icon of "Apply Change". And then listen, the wonderful background music voice out. Eventually, you feel comfortable reading with music which make the atmosphere peace and quiet.